An estimated 2 in every 5 Americans who reach the age of 65 will develop skin cancer sometime in their life. Approximately 12,000 people will die from skin cancer in 2009. The good news is skin cancer is the most curable form of cancer and is also the most preventable form of cancer. The most important thing to know is early detection saves lives and most skin cancer can be prevented by protecting your skin from the hot Chicago golf sun! 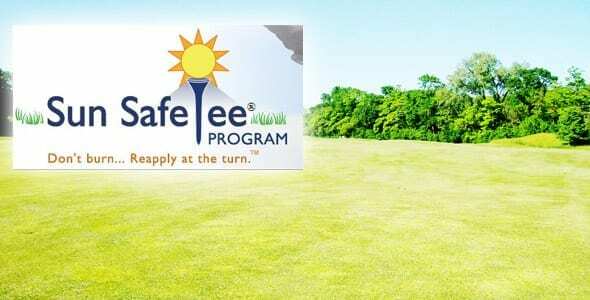 Introducing the The Sun SafeTee Program, which provides sun protection education and skin cancer awareness programs specifically for the golf community. The Sun SafeTee Program was started by Mark Wishner, an avid golfer, who himself had skin cancer. He noticed that there was a lack of resources available to golfers about the dangerous effects of the sun. Mark now devotes his time to educating the golf community on the importance of protecting themselves from the sun’s UV rays. Approximately one million Americans will be diagnosed with skin cancer this year, and since golfers spend a significant amount of time in the sun, they are at a greater risk than the general public for developing skin cancer” according to Sun SafeTee Board member Curt Littler, MD. The Sun SafeTee Program suggests that golfers should always use sunscreen with a minimum of SPF 30 and one that has broad spectrum (UVA and UVB) coverage. Since many sunscreens only last for two hours, the motto of The Sun SafeTee Program is “Don’t burn…Reapply at the turn”. A long sleeve shirt, long pants and a wide brimmed hat also are valuable sun protection tools.